Find out the latest news where you are. Showing the top 10 news articles. ECCO Group, with headquarters in Boise, Idaho, announces the acquisition of Public Safety Equipment Group (PSE). ECCO Group is primarily engaged in sales of reversing safety and amber warning products for commercial vehicles and recognizes PSE as the ideal platform to expand its global presence and its footprint to the worldwide emergency vehicles sector, allowing the group to compete as a strong global player in both sectors. The expanded organization, as ECCO Safety Group, will have manufacturing in nine locations on four continents, along with an additional four sales offices in Europe, Australia and China, together employing 900 team-members. ECCO Group currently employs 270 people around the world with manufacturing locations in USA, Europe, Australia and a sales office in China. PSE employs 630 people with manufacturing locations in the USA, Europe, Australia and China; along with sales offices in Germany and France. 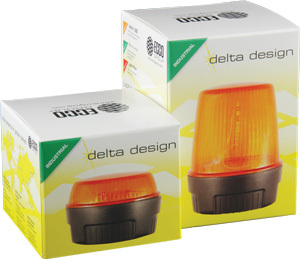 After consulting many of our customers we are introducing a new packaging design for Delta Design products. Whilst retaining the Delta brand image, the new design also emphasises the global support and expertise available from ECCO Group. The Delta Design brand will focus on non-vehicle industrial products and automotive products will be progressively integrated into the Vision Alert / ECCO programme. Pictured here is the new packaging design for the LP and LT beacons. Our sister company in the USA celebrates their 40th Birthday! In 1971, the US Occupational Safety and Health Administration (OSHA) enacted job safety legislation requiring back-up warning alarms on all vehicles that operated off public roads. Recognizing the business opportunity created by the requirement, Carl Peterson established ECCO in 1972 and began marketing a limited line of back-up alarms. Today ECCO offers one of the most comprehensive lines of commercial vehicle warning equipment in the world, has facilities on three continents, more than 500 employees and 1000's of customers, including many of the most prominent vehicle manufacturers. The popular VigiLED directional LED lamp is now available as a worklamp. Tested to IP69K standard, the highest international protection rating available for this type of product, the worklamp is dust and pressure cleaning proof. The intense constant white light from the 36 LED heads outputs an extremely bright 545 Candelas (max). 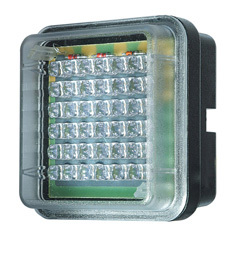 Available as both surface and bracket mount this compact(measuring 72mm x 72mm) LED worklamp will fit onto the smallest surfaces, perfect for mounting on many different vehicles from CV and recovery vehicles to refuse trucks and material handling. 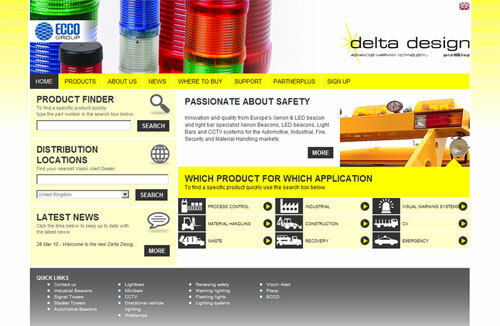 Our brand new website reflects our sister company Vision Alert's website, released earlier this year whilst retaining the unique characteristics and specialization of the Delta Design brand. Visitors to the site can browse our online product catalogue, which is split into two distinct product areas, industrial and automotive applications. Customers new to warning and safety can also drill right down to recommended products a particular application by using our shortcuts on the homepage, each tailored to individual industries.